Hi friends! My name is Holly and I am the Lead Associate here at Merry Character Photography! You may already know some fun facts about me, like how much I love animals, farming and of course, ice cream! However today I wanted to tell you three hard things that have happened in the last year that are a little more personal in my life. While being extremely excited about starting my career in photography, I also found out shortly after that my mom was diagnosed with breast cancer. Talk about a whirl wind of emotions! It was extremely hard for me to balance the feelings of happiness and joy with photography and the sadness I felt for what my mom had to go through. To top that all off, after some testing I found out that I carry a gene that is related to the breast cancer that runs in my family. Thankfully we discovered it while I am fairly young and I can take preventative measures for the future. Also, with many prayers and a ton of support I am crazy joyful to tell you my mom is now CANCER FREE!!!! I now have that all around happy feeling! Some of you may know me from when I worked at the Coffee Hound, because let’s get real, who doesn’t like coffee?! (Mary doesn’t but she doesn’t count 😉 ) When I decided to leave my job at the Coffee hound it was one of the hardest, more difficult decisions I’ve had to make. It was a great job with a happy atmosphere that I loved to go to work everyday. I got to work with my best friends, see all sorts of people, and obviously…the coffee – yum! 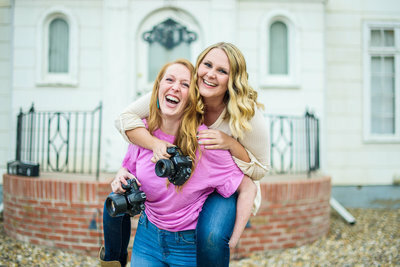 I finally made the decision that it was time to jump both feet into photography full time! Although it was a hard decision to leave, I am happy that I can now serve more clients, do what I love everyday and even help out more at the farm! It is so amazing how life works and how we make many difficult choices every day that help us get to where we are supposed to be. Where I am now in my career makes me so happy and I cannot wait to see what awaits me in the future! The thing most people my age are waiting and waiting to finally happen, happed to me a few months ago – I turned 21! My age is something I struggle with because I like to think of myself as a mature, qualified entrepreneur. However with being so young I am always worried people will second guess my skills or my ability to serve them well. My age has not stopped me from wanting to be the best that I can be and serving my clients with as much respect and loyalty as any other photographer! Since my age is something that I am self conscious about, balancing turning 21 with my professional life felt like a big obstacle. From having friends wanting me to go out with them & finally being able to go but not wanting to leave a bad impression with anyone who may see you out really is a hard balance for me. I fear that I have to work extra hard to prove myself capable because I am “young”. I am sure it will take time to work with these fears and adjust my life/work balance, but we are all human and I am just going to try my best and work as hard as I possibly can! There you have it! Three hard things that happened this past year in my life! I love the saying, “Be kind you never know what kind of battle someone else is walking through”. It is so true! I can bet you had no idea I had those things happening in my life. I have been able to find a positive outlook on them all but I felt like it was important to share so it can help remind you that everyone has things on their plate! No matter what we share and don’t share on social media, there is always more happening in our lives! I encourage you to find the good in the hardest of situations! So beautiful Bug. ❤️ I’m so proud of the young woman you have become.